We’d love your help. 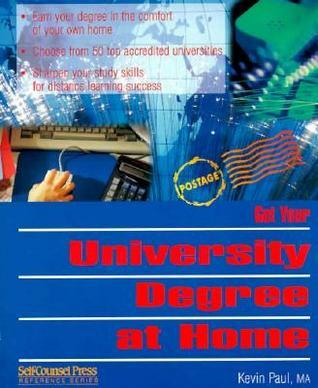 Let us know what’s wrong with this preview of Get Your University Degree at Home by Kevin Paul. Published April 7th 1999 by Self-Counsel Press, Inc.
To ask other readers questions about Get Your University Degree at Home , please sign up. Having met the author when I was a student at the University of Victoria when he was the Director of Graduate Admissions, I had a lot of confidence in his ability to present a no- nonsense approach to the idea of Distance Education. And for the most part, he delivered. [Note: This review is of the edition of the time, vastly out of date now 20 years later). The overviews give you a lot of info, but a nice index would improve the process." I received no compensation, not even a free copy, in exchange for this review. I am not personal friends with the author, but I did know him as Director of Graduate Admissions at the university where I was at a student..